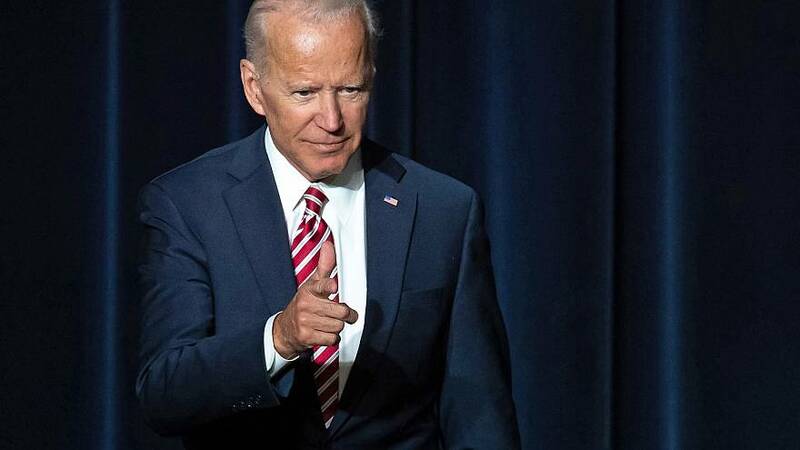 WASHINGTON — If Joe Biden is going to run for president — and win — he can't do it the old-fashioned way. It suggests Biden can't win by himself; it discourages alliances and endorsements from other 2020 candidates; and it eliminates the veepstakes speculation in the summer of 2020 (when a nominee-to-be is looking to raise his/her name ID, build a national infrastructure and rake in lots of money). But it also acknowledges that Biden has to be unconventional if he wants to win - as Beto-mania, Pete-mania, and Kamala-mania are real things. So what do you do when you're Joe Biden — a reliable Chevy — as Dem voters want to try out some other flashier, newer cars? The New York Times dives into President Trump's dealings - and history - with Deutsche Bank. "Mr. Trump used loans from Deutsche Bank to finance skyscrapers and other high-end properties, and repeatedly cited his relationship with the bank to deflect political attacks on his business acumen." "Deutsche Bank used Mr. Trump's projects to build its investment-banking business, reaped fees from the assets he put in its custody and leveraged his celebrity to lure clients." "More than two years later, Mr. Trump's financial ties with Deutsche Bank are the subject of investigations by two congressional committees and the New York attorney general. Investigators hope to use Deutsche Bank as a window into Mr. Trump's personal and business finances." The question we've always had: How did Trump become debt-free before he became president? NBC's Pete Williams reports that a federal appeals court today will hold the highest level hearing yet on the claims that President Trump's business dealings violate the Constitution - and that they represent a conflict between profits and the nation's interest. "The attorneys general of Maryland and Washington, D.C., accuse Trump of violating the Constitution's emoluments clauses, which bar the president from receiving 'any present, emolument, office or title of any kind whatever from any king, prince or foreign state' or any state in the U.S."
"Their lawsuit, filed in 2017, says the president improperly benefits financially whenever foreign or state governments patronize the Trump International Hotel on Pennsylvania Avenue." "Justice Department lawyers counter that the term 'emolument' has a very specific and much narrower meaning — a payment made to a public official in addition to his or her official salary… Administration lawyers are asking the U.S. Court of Appeals for the 4th Circuit, based in Richmond, Virginia, to throw the lawsuit out." In the town hall hosted by MSNBC's Chris Hayes, Kristen Gillibrand addressed calling for former Sen. Al Franken, D-Minn., to resign. "This is a very hard issue for so many Democrats, because the truth is we miss him. People loved him. But he had eight credible allegations against him," she said. "I had a choice to make -- whether to stay silent or not, whether to say it is not OK with me. And I decided to say that… And if there are a few Democratic powerful donors who are angry because I stood up for women who came forward with allegations of sexual harassment, that's on them." Meanwhile, in her CNN town hall last night, Elizabeth Warren discussed reparations ("I believe it's time to start the national full-blown conversation about reparations in this country"), distanced herself a bit from eliminating private health insurance ("There could be a role [for private health insurance]. Or there could be a temporary role"), and she talked about her religious faith ("Two things that guide me every day. The first is there is God, there is value in every single human being.... And the second is that we are called to action"). Warren campaigns in Alabama... Beto O'Rourke mades a stop in State College, PA - before heading to New Hampshire... Gillibrand stumps in Iowa... And Seth Moulton visits South Carolina. That's the share of respondents to a Suffolk/USA Today poll who said they have "little or no trust" in Trump's denials of collusion between his campaign and Russian meddlers in the 2016 election. The same poll also featured a question which prompted the president to boastfully tweet that half of the country agrees with his assessment that the Mueller probe is "a witch hunt." But many polling experts took aim at design of that question, which asked: "President Trump has called the Special Counsel's investigation a "witch hunt" and said he's been subjected to more investigations than previous presidents because of politics. Do you agree?" Democratic pollster Geoff Garin of Hart Research said this: "This is a badly written poll question, because it is asking two different things at the same time. Are respondents agreeing that the investigation is a witch hunt or that Trump is subjected to more investigations than other presidents?" Don't miss the pod from yesterday, in which we delved more into the problems of double-barrel questions in public opinion polling. Bernie Sanders' opening argument seems to be largely about electability. Beto O'Rourke met with that UAW union rep who was called out by Trump on Twitter over the weekend. Mick Mulvaney appears close to getting the "acting" dropped from his chief of staff title. Trump's response to the New Zealand attack is drawing attention to some of the ugliest parts of his rhetoric. Kirsten Gillibrand says she'll go after drug companies for their role in the opioid crisis.